These opposites are not so different, as they both stand apart from everyone else. Sun in Aquarius’ focus on individuation is complemented by Moon in Leo’s need for self-expression. 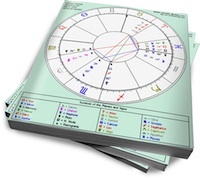 Detached Aquarius may not fully support Leo’s need for attention, but he’ll understand it. Together, these two can create a relationship where each partner’s uniqueness enhances the other’s. Sun in Aquarius‘s place is left of center. Whether he’s an artist or accountant, he’ll find some way to give it his own spin. Sun in Aquarius’ primary goal is to not fit in, and in a relationship, his lover must be prepared for the fact that he’ll rebel if he’s expected to conform. This means giving him liberal doses of freedom and personal space. In return, he’ll be a steadfast partner, lover and best friend. Moon in Leo needs adoration, although this may not be immediately obvious (depending on her Sun sign). But eventually, her partner will discover the diva’s fire that needs constant stoking. Moon in Leo loves with a bright, generous heat, but that fire can quickly flare up in anger if she feels ignored. Her emotional demands can be exhausting for some. Moon in Leo may initially feel resentful when Aquarius greets her needs with cool indifference. Sun in Aquarius will not rush to fawn over this queen, but he may be intrigued enough to stick around and see what she has to offer. If Leo can see past her bruised feelings, she’ll come to realize that he has something to teach her about objectivity. And she’ll get a kick out of how Sun in Aquarius stands out with his odd habits and flashes of brilliance. Eventually, each can reach a point where they appreciate the other’s unique qualities. Between Leo’s domestic drama and Aquarius’ eccentricities, boredom will never be an issue. The magnetic tension will keep them both coming back for more.